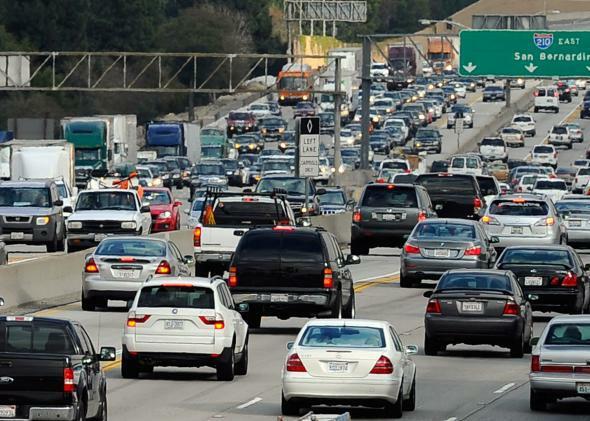 Thanksgiving traffic: How to avoid it according to Google Maps and Traffic data. Thanksgiving traffic near Los Angeles in 2010. The worst thing about driving around Thanksgiving is that it feels like no matter when you pick to make your move, it’s always wrong. Left Wednesday night? You should have gone Thursday morning. Tried to sneak out on Tuesday? Wednesday before 2 p.m. would have been better. Now, since Google has so much access to maps and traffic data, the company is trying to help you learn from the country’s collective mistakes. It combed through information about 21 cities around the country to give you a sense of when to hit the road. 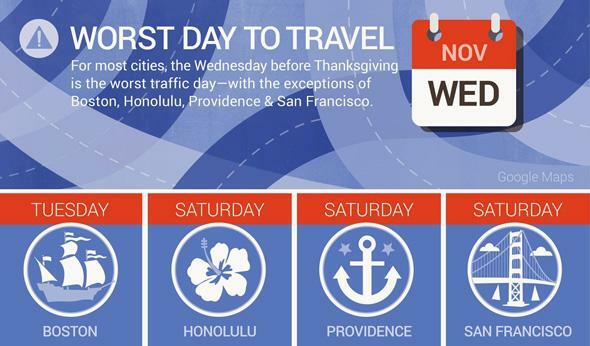 Google found that in general the worst traffic day of the whole Thanksgiving week is Wednesday. In Boston the worst day is Tuesday (everyone must be trying to outsmart each other by leaving early), and in Honolulu, Providence, and San Francisco the heaviest traffic comes on Saturday. Google points out that if you have to travel on Wednesday, there’s the most congestion between 3 and 5 p.m., so you should try to go earlier or later. Wednesday is always kind of a disaster traffic-wise. The company found that if you’re trying to be sneaky by traveling on Thanksgiving Day itself, you’re actually making a good call. Google Maps and Traffic data shows that Thursday has the least traffic of any day in the Thanksgiving week, especially if you drive before noon or after 2 p.m. In terms of going home at the end of the holiday, you might think that Sunday would be the worst option because everyone has to leave at once, but Google found that Sunday traffic is actually lighter than Saturday’s. It’s great that Google analyzed its traffic data to put these tips together, but a word of caution: The whole project could backfire if everyone takes the advice to heart and starts traveling when Google recommends. You just can’t win. It’s not all bad news, though! Google says that in Boston, Dallas, Honolulu, Los Angeles, Pittsburgh, and Providence, traffic delays actually improved between 2012 and 2013. In general, Philadelphia, Austin, and Washington, D.C., are the top three cities that are most impacted by Thanksgiving traffic. Providence, Boston, and Denver were on the bottom of the list, and cities like Los Angeles and Tampa came in in the middle. The top three places people search for on Google Maps the day before Thanksgiving are “ham shop,” “pie shop,” and “liquor store.” Last-minute stops are understandable, but what’s a ham shop?